Turn left into parking lot at trailhead, per signage for "Dickerman/Perry Creek"
The trail begins its ascent in the shadow of towering conifers densely clothing the base of the mountain. Mount Dickerman Trail, September 14, 2014. From Mount Dickerman’s summit in the heart of the North Cascades, rugged mountain peaks stretch in every direction as far as the eye can see. The trail climbs steeply through heavy, mostly coniferous forest with tantalizing glimpses of the surrounding peaks until it clears the treeline, where sweeping alpine meadows yield truly expansive views until the mountain’s sway-backed summit and its 360-degree panorama are attained. 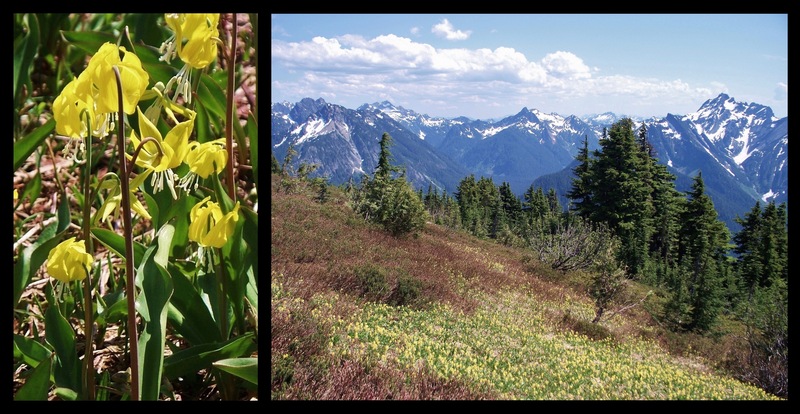 Snow can linger on the mountain’s summit and meadows until at least July, when it briefly gives way to drifts of summer wildflowers. Be sure to check recent trip reports at the Additional Trail Info link above for information on current conditions. Although Mount Dickerman is nestled in the southeastern crook of the Mountain Loop Highway, no trace of the road is seen or heard beyond the trailhead. However, the trail is a popular hiking destination; on weekends, be prepared to enjoy the summit’s views with at least a few other hikers. And, because the summit’s northern edge is bounded by sheer cliffs that plunge precipitously into the valley beyond, caution must be exercised to prevent potentially disastrous falls, especially with children. Telltale fruits give an Oregon-grape (likely a holly-leaf Oregon-grape, Berberis aquifolium, a.k.a. Mahonia aquifolium) its name, however misleading, given that it is neither a grape nor endemic only to Oregon. Mount Dickerman Trail, September 14, 2014. Even at lower elevations, giant boulders and rocky outcrops line the trail, previews of the craggy landscape to come. Mount Dickerman Trail, September 14, 2014. As the trail climbs, the forest parts to reveal glimpses of the surrounding peaks. Here, Big Four Mountain peers above the treetops. Big Four Mountain is not named for the clearly more than four knuckles along its summit, but rather for a curious patch of snow on its eastern flank that sometimes appears in the shape of the numeral “4”. Mount Dickerman Trail, September 14, 2014. To Mount Dickerman’s south rise Lewis Peak (on the left) and Del Campo Peak (on the center right), outliers in a dense cluster of peaks known in climbing terms as the “Monte Cristo Group” or “Monte Cristo Area,” or, colloquially, the “Monte Cristos” (and not to be confused with the Monte Cristo Range in southwest Washington). The Monte Cristos are named for the short-lived mining town built among them in the 1890s, which was, in turn, named when a prospector likened a vein of gold ore to the wealth of the fabled Count of Monte Cristo — incorrectly, as it turned out. Mount Dickerman Trail, July 11, 2009. 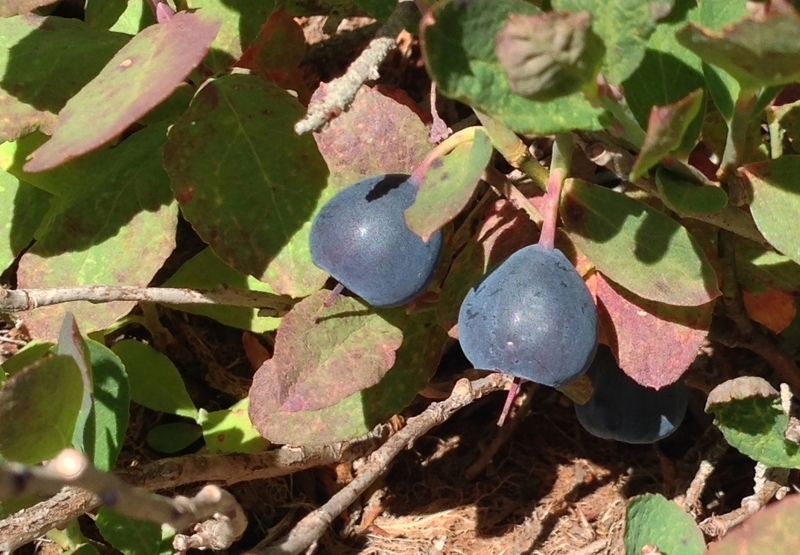 During the fleeting alpine summer, luscious blueberries (likely Cascade blueberries, Vaccinium deliciosum) lie hidden in several barrens near the treeline, their bushes forming an inches-high groundcover where little else grows. Mount Dickerman Trail, September 14, 2014. 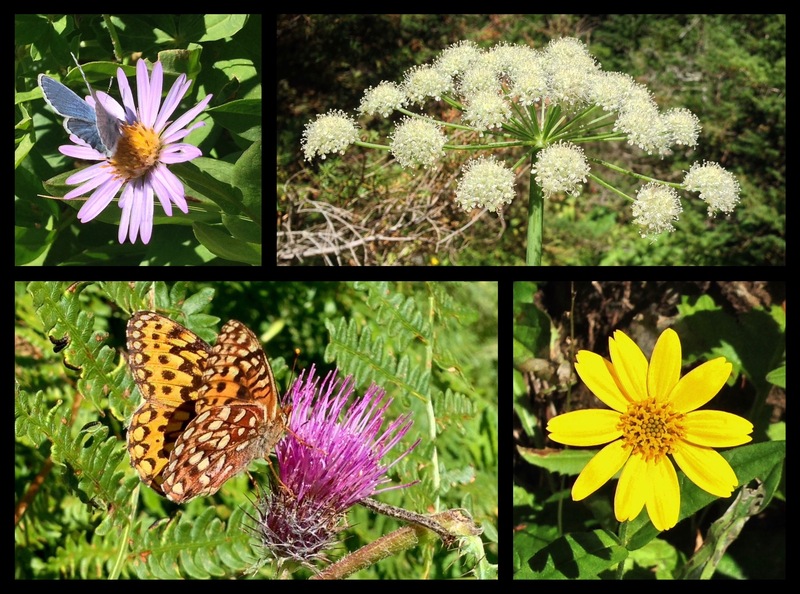 Here and there, wildflowers — and the butterflies that frequent them — fleck trailside forest clearings, including alpine leafybract asters (Symphyotrichum foliaceum) (upper left); sharptooth, or, Lyall’s angelicas (Angelica arguta) (upper right); edible thistles (Cirsium edule) (right), here, visited by what is likely one of many similar species of fritillary (Speyeria sp.) (lower left); and spear-leaf arnicas (Arnica longifolia) (lower right). Mount Dickerman Trail, September 14, 2014. Shortly before the trail reaches the mountaintop meadows, Mount Dickerman’s summit looms eastward far above the dwindling treetops. Take courage, for the trail arcs widely upward around the summit from the mountain’s southern slope, lessening the effect of the remaining elevation gain. Mount Dickerman Trail, September 14, 2014. Near the mountain’s peak, meadows and views open. Here, from left to right, Silver Tip, Lewis, Del Campo, Morning Star, and Sperry peaks line the near horizon. Mount Dickerman Trail, September 08, 2012. During the alpine spring, swathes of yellow avalanche-lilies (Erythronium grandiflorum) carpet the mountainside. Here, the Monte Cristos lie beyond the flower-clad meadow, including Silver Tip Peak in the center and Lewis and Del Campo peaks on the right. Mount Dickerman Trail, July 11, 2009. In the mountaintop meadows, snow persists into summer, but is quickly replaced by sweetly scented lupines (Lupinus sp.) and other wildflowers during the brief alpine growing season, as demonstrated by these photos taken from nearly the same vantage in July and September. The Monte Cristos form the horizon in both photos. 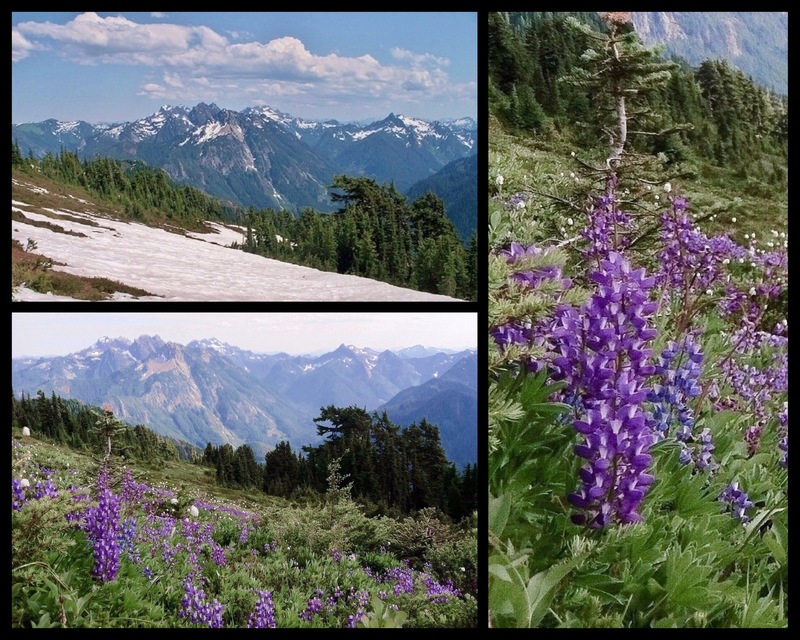 Mount Dickerman Trail, July 11, 2009 and September 08, 2012. Near the summit, truly panoramic views begin. Here, Vesper Peak, Big Four Mountain, Hall Peak, and, in the distance, Mount Pilchuck rise beyond Mount Dickerman’s autumn-tinged meadows. Mount Dickerman Trail, September 14, 2014. Just north of Mount Dickerman on the other side of Perry Creek’s deep valley is the roughly Z-shaped, deeply fissured Stillaguamish Peak, with Pemmican Peak forming its western (here, left) arm and Mount Forgotten its eastern (right) arm. Beyond, a parade of peaks rides the horizon, including Three Fingers and Whitehorse Mountain on the left, snowy Mt. Baker and Mount Shuksan in the distant center, and White Chuck Mountain and Mount Pugh framing Mount Forgotten on the right. Mount Dickerman Trail, September 08, 2012. Mount Dickerman’s rugged eastern view encompasses White Chuck Mountain, Mount Forgotten, and Mount Pugh on the left of this photo, Glacier Peak and Twin Peaks in the center (with Twin Peaks centered just below Glacier Peak and appearing as a single peak because of its east-west orientation), and the tri-tipped Bedal Peak and Sloan Peak just right of the center. Mount Dickerman’s eastern hump curves upward in the right foreground. Mount Dickerman Trail, September 15, 2013. In the southern view from Mount Dickerman’s summit, creeping clouds pour into the valleys below the Monte Cristos, including Silver Tip Peak in the center and Del Campo Peak on the right. Mount Dickerman Trail, September 15, 2013. Summer haze emphasizes the jaggedness of each succeeding mountain fold. Beyond Mount Dickerman’s western knob in the left foreground lie Pemmican and Stillaguamish peaks and, on the horizon, Three Fingers, Whitehorse Mountain, and, faintly, Mt. Baker. Mount Dickerman Trail, September 08, 2012. Mount Dickerman’s northern face plunges headlong into Perry Creek’s valley far below. Care should be exercised along its ledges. Mount Dickerman Trail, September 15, 2013. Even in the most seemingly inhospitable of habitats, life eeks out an existence. Among the stones along the brink of Mount Dickerman’s northern precipice, look for cliff paintbrush (Castilleja rupicola) blooming amid beady, blushing succulents (likely spreading, or, Cascade stonecrop, Sedum divergens) (upper left); drifts of both white heather (Cassiope mertensiana) and pink mountain-heath (Phyllodoce empetriformis); and spreading phlox (Phlox diffusa). Mount Dickerman Trail, July 11, 2009.